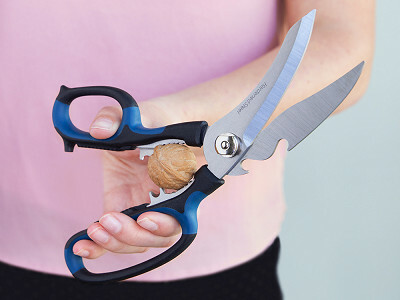 You name it—these Made for a Lifetime, multipurpose scissors can likely cut through it. 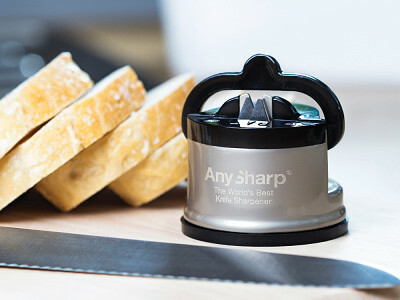 AnySharp’s tempered, razor-sharp steel blades can handle jobs all around the house—from stripping wires, to cutting plastic, and cracking nuts. The blades curve away from your hand, making it safer and more comfortable when you have to cut at an angle. Keep a clean pair in the kitchen to slice meat, cut bones, and crush garlic. Then have another pair handy in the garage to glide through cardboard, plastic, even fabric. These scissors won’t judge your handedness either. AnySharp’s soft, fitted handles make them comfortable for lefties and righties alike. Hello everyone! I'm proud to introduce 5-in-1 Scissors to The Grommet. I'd be happy to answer any questions you have! I've never seen a curved pair of scissors before, where did you get the idea for that? @Mike We saw them first on a pair of meat scissors. But we adopted them when we got deep into it, and we cut our hands on a big blister pack. We made a few, and I had them tested by my aunt, who has problems with her hands. She explained they were incredibly comfortable, so we kept them. The idea of creating a pair of scissors to tackle any task appears daunting, what was your primary focus during development? I am thinking this product will work well in my kitchen, but I am curious if the product is dishwasher safe. @Seth Yes, they are totally dishwasher safe. It was a basic requirement for us, because firstly we don't like cleaning ;), and secondly we thought people could get hurt cleaning them. Hope that helps! @Yusuf Thanks for that reply - that was my question also! What type of metal did you use to make the scissors? And how long, about, will the cutting edge last? @Paul No, Paul. AnySharp is based in the United Kingdom. But we maintain standards that would pass in the USA too. Thanks! @Yusuf Where is the product manufactured? "Based inthe UK" doesn't tell us where the scissors are made. Hi Flo, they're made in China. Can you tell me about the mechanism that attaches the blades together? On many scissors this is the point of weakness and they break and or rust. Also, what does a lifetime guarantee mean? Will you actually replace a pair of broken scissors at no charge? @josh The blades are attached by a connecting rod with a thread, and they are bolted together with a special fastener. The fastener has a shape that will allow you to tighten them up again if required. The Product Lifetime warranty does need some explanation. The lifespan of the scissors is 5 years, and under normal use, they should last MUCH longer. The lifetime warranty means we will take full responsibility for any lack of function or any failure within that 5 years. It's a warranty for the lifetime of the scissors, not the user - and yes, we would replace them without hesitation. Can these scissors be washed in the dishwasher? @Janice D Yes, they are totally dishwasher safe. It was a basic requirement for us, because firstly we don't like cleaning ;), and secondly we thought people could get hurt cleaning them. Hope that helps! If/when the blades so become dull, can they be sharpened? @sally Yes, they can be sharpened if they become dull. But what we would also remind everyone is that scissors don;t cut, they shear. 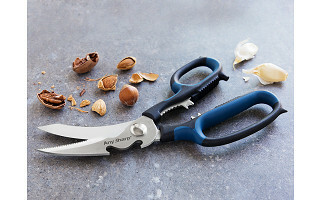 Shearing can become ineffective if the fastener holding the blades comes loose, but in this pair of scissors, you can retension them in seconds, so sharpening should not be necessary. If you DO ever need to sharpen them, please note they have a single sided bevel, and should not be sharpened in a regular knife sharpener, and they should never be sharpened on the flat side. Only sharpen by honing the bevelled side with a steel. If you sharpen them on the flat side, they could be ruined. We have never sharpened ours, so I doubt you will need to. What is the purpose of the odd "double horned" cutout in the bottom of the blade? It might seem strange - but it's just a handy extra feature, so we thought we'd add it. It's turned out to be surprisingly useful and handy! Can these scissors be sharpened? They sure can, Judith, check out Yusuf's answer just above here. OMG -- Got all the way to the end of my order today -- 9/19 only to find out they were out of stock!!! Wanted 3. Do you know when Grommet's supply will be restored? They are replenished right now, NJ! Sorry about that. You willed it so, NJ. They are back in stock after a momentary glitch. Can you compare the cutting ability to the famous Cutco shears which cut coins in two. @Jonathan I had to look them up - sorry, we have never tried the item you mention. What we can say is our scissors were not intended to cut coins, and we have no "whizz bang" demos to show that. The Cutco may be better for cutting coins, we don't know. 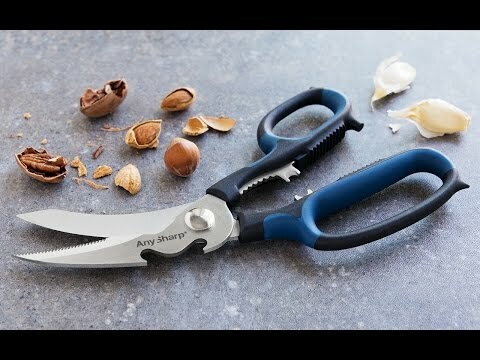 What we do know is AnySharp Scissors have a curved blade and soft grips for comfort, which Cutco don't seem to have, and they look a lot weaker and thinner than the AnySharp. Further, we think our handles are bigger so you can use the fingers further down, reducing strain. Sorry not to be more specific! I guess if you need to cut coins, might be better to stick with the item you know can do that. But if you want to have comfort and like your coins in one piece, then AnySharp looks more comfortable. I think the design and functionality of your scissors are great! My first impulse was that these would be great in my husband's toolbox as well as my kitchen drawer. Have you thought of a sheath for safety? A plastic molded one shouldn't be too costly. It would also protect the blades. Just a thought. @Carla : A blade sheath is a great idea! Since I do most of the small work around the house, I have a fully stocked tool bag and box. I don't alway pay attention the way I should and grab things the wrong way or drop them when I pick them up. A blade sheath would definitely help with the "klutz factor". Also, I have pretty bad problems with my hands and these shears look like they would be much easier to use than my regular scissors. I'm ordering two pair - one for the kitchen and one for the tool bag. Thanks, Yusuf! @ANN Our pleasure. I hope you enjoy them. We have numerous users in the UK that bless these scissors on a daily basis because of comfort and arthritis issues. For what it's worth, my 9 year old daughter is running around the house screaming with joy because her "invention" of the soft grips is so popular with people all the way in the USA. When we made them, she said they needed to be soft, as they hurt her hands with hard things. You have made a little girl very happy! @Carla A great idea. No, we didn't think of that. 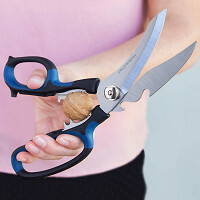 We have seen it before, but they were originally designed for the kitchen, and we just clip them to the magnetic knife strip in the kitchen, so a sheath never seemed necessary. But maybe it's time to consider it, and make a Macho version for the guys. ;). With a sheath. Thanks for a great idea! Maria- was about to buy and then noticed "made in China", though in one of Yusuf's answers it says the UK....???!!! Hi Maria, AnySharp is based in the UK but made in China. @Mike Sorry if that was misleading. Never the intention. AnySharp is based in the UK, and I mention it becuase we must adhere to UK standards. I assumed that was the query - about standards, safety and quality. Yes, we do manufacture these in China, but they are made to UK standards. @Yusuf What thickness sheet metal (tin) can your scissors reasonably cut, without soon ruining them? For example "food tin can type sheet metal"? @David Honestly, we have absolutely no idea. We didn't test them with sheet metal, and we didn't beat that function in mind when we designed them. If you're buying specifically for that purpose, they may not be for you. Alternatively, try them. If they fail totally, write to us and we will refund you. If they do work well, write to us and we will use your research to let others know what the limits are. As for the warranty, cutting sheet metal wouldn't qualify as standard usage. Sorry I can't answer this one. You got me. How do these compare to "Smart Sizzors". They have the same design? Are they both your product? @David They are the same design. This version has even better steel, and is packaged very nicely. The new AnySharp products have all been upped a level during 2016. Thanks. 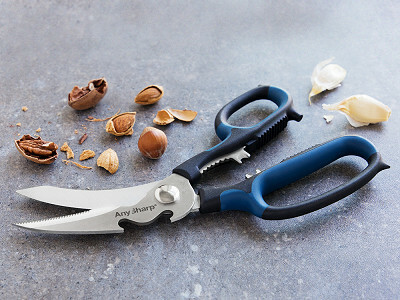 can you use these scissors to cut shrubbery? @Guest Yes! Absolutely wonderful for that, and makes it simple to cut right through. It's one of the ideal uses for these, and we have had many people tell us so. Thanks for asking. @Sharon 153 grams, which is about 5.4 ounces, which is about 1/3rd of 1lb. That is the net scissors weight. With packaging a little more. Hope that helps. Hi. I am the CEO of AnySharp, based in the UK. Janet is a good friend, and I have been helping her out today with the Q & A session. I'd just like to say thanks on behalf of AnySharp to the Grommet team for the launch day. I would also like to thank the people who asked wonderful questions, and suggested what we might do to improve our product even further. It's Product Development Gold for companies that care when people with real feedback and interesting questions get involved. Some of you made us chuckle in our offices today. Thanks! Thanks so much for your thoughtful and prompt answers, Yusuf! You name it—these Made for a Lifetime, multipurpose scissors can likely cut through it. AnySharp’s tempered, razor-sharp steel blades can handle jobs all around the house—from stripping wires, to cutting plastic, and cracking nuts. The blades curve away from your hand, making it safer and more comfortable when you have to cut at an angle. Keep a clean pair in the kitchen to slice meat, cut bones, and crush garlic. Then have another pair handy in the garage to glide through cardboard, plastic, even fabric.